I wouldn’t normally even bat an eyelid at reviewing what some might call a chain restaurant. But there’s something about this place, its relaxed atmosphere, low key but sophisticated decor and delicious food that not only pulls me back time and time again but also excites me enough to share it with you. My most recent trip to this delightful place (I always go to the one in Bankside, just south of the river, London) came at a time when the nights were starting to draw to close much quicker and rain was starting to once more inflict a sense of constant grey and gloom over the world. Walking in allows the smells of delightful cooking pizza to waft past you, the sound of ingredients being sizzled for the pastas and to witness the freshest ingredients being carefully tossed around to make a divine salad. You’re greeted with friendliness and a warm welcome. The attitude of the staff leaves you feeling like a soft fluffy teddy bear has wondered over and given you a hug. They give you your card so you can order many delightful items through it, in a kind of electronic tab system, and politely ask if you’ve been before and know how it works. With the freedom to choose your seat you can wander the restaurant and admire a wide variety of seating arrangements covered in dating couples, students unwinding, business people trying to seal a deal over a tasty bit of food and others just eating at their favourite Italian place in town. On securing your seats and some menus you realise the slow trickles of people from seats to bar and food ordering sections. Some return grinning clutching onto a steamy and elegantly presented bowl of pasta, others look sheepish and wave their salad around in the ‘look how healthy I am’ kind of way whilst the rest return holding a funny little black device. The pizza buzzer is possibly one of my favourite restaurant things. Perhaps my easily amused nature does lead me to giggle as it nudges across the table to grab my attention and tell me my pizza is ready. However, the best thing about it is they know nobody wants to stand around, away from their company and awkwardly, waiting for their pizza to be lovingly crafted and carefully cooked. It makes the self-service vibe 100x better. 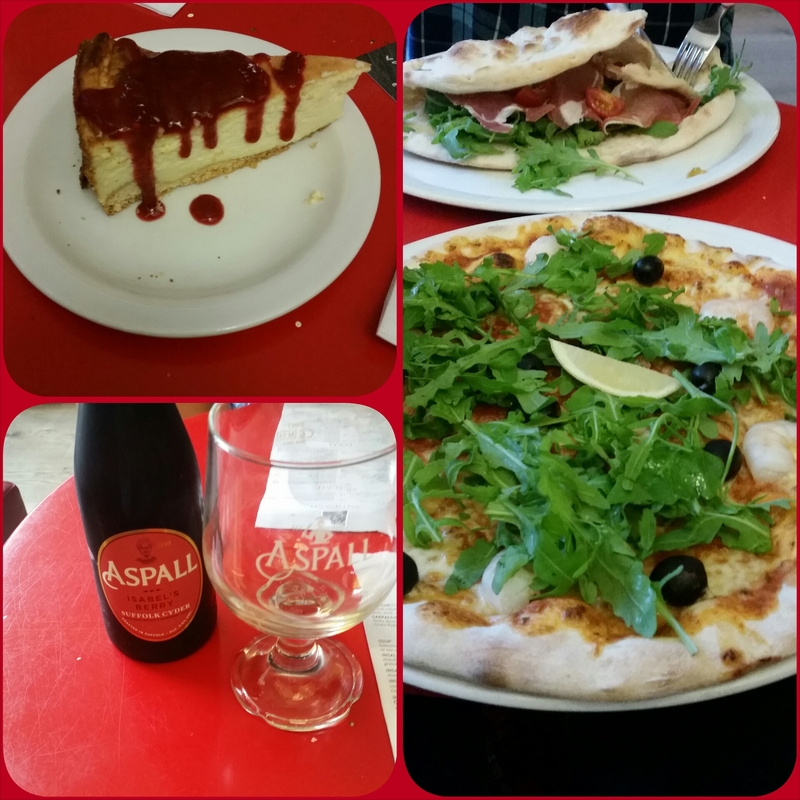 So on my most recent visit, after being taken their for the first by my boyfriend three years ago, I had a succulent, juicy, fresh and vibrant seafood pizza, with some amazing and not-so-sweet Aspall berry cider to contrast followed by the soft and fluffy cheesecake with lavish strawberry sauce. As always I had an absolutely amazing time and I will return to my favourite haunt some time in the near future when time and money allow. Though of course it is the kind of place where you can be as quick or slow as you like and with most mains under £10 it isn’t too expensive a meal out. You can find which of the 150 worldwide restaurants is your nearest Vapiano at their website – http://www.vapiano.com – I’m sure they hope to see you soon. And remember to take a gummy bear or two from next to the tills when you head on out. This entry was posted in Food and Drink, Restaurant Reviews and tagged ales, atmosphere, baking, Bankside, Bread, brunch, Cheese, cheesecake, childhood food, childhood memories, cider, classic food, Cook, cooking, cost, dairy, Dairy replacements, desserts, Dining, discussion friendly, Drink, drinks, eating, eating out, eggs, family friendly, food, food pictures, fresh, fun, Hot, italian restaurant, Lifestyle, Lobster, London, lunch, mains, meal out, meals, meat, pescatarian, restaurant, Restaurant review, review, vegan, vegetarian, vibrant. Bookmark the permalink.